Palestinian President Says U.S. No Longer Qualified To Broker Peace Talks President Mahmoud Abbas said Friday the U.S. is not qualified to sponsor the peace process between Israelis and Palestinians because of President Trump's recognition of Jerusalem as Israel's capital. A Palestinian protester throws back a tear gas canister that was fired by Israeli soldiers during clashes on the Israeli border after a protest against President Trump's decision to recognize Jerusalem as the capital of Israel. Palestinian President Mahmoud Abbas said in a statement Friday that the U.S. is no longer qualified to sponsor a peace process between Israelis and Palestinians because of President Trump's decision to recognize Jerusalem as Israel's capital. Thousands of people across the Middle East took to the streets on Friday, the Muslim holy day, to protest the move by Trump, the first world leader since Israel's founding to declare Jerusalem the country's capital. Palestinian chief negotiator Saeb Erekat told Al-Jazeera TV on Friday that the Palestinians will cease communication with the U.S. until Trump reverses his decision. At least one Palestinian was killed and more than 80 were wounded in clashes with Israeli soldiers, according to the Palestinian Red Crescent Ambulance service. "So far, these protests are not the biggest we've seen even in recent times," she says. "They certainly don't amount at the moment to an 'intifada' or uprising, which is what the Islamist group Hamas has called for." The Palestinian uprisings of the late 1980s and early 2000s led to the deaths of thousands of Palestinians and Israelis, Reuters reports. United Nations Mideast envoy Nickolay Mladenov urged leaders at an emergency Security Council meeting on Friday to advance efforts on the Israeli-Palestinian peace process, warning that the conflict "risks being engulfed in the vortex of religious radicalism throughout the Middle East." For decades, both sides have fought for control of Jerusalem. Israelis claim the entire city as their capital, while the Palestinians seek control of the eastern part of the city as the capital of a future state. According to the BBC, at least 330,000 Palestinians live in East Jerusalem, which has been occupied by Israel since the 1967 war. Trump broke from long-standing U.S. policy this week when he declared his plan to move the U.S. Embassy from Tel Aviv to Jerusalem. Secretary of State Rex Tillerson told reporters in Paris on Friday that the decision "did not indicate any final status for Jerusalem" and asserted the city's standing should still be settled in negotiations between the two sides. 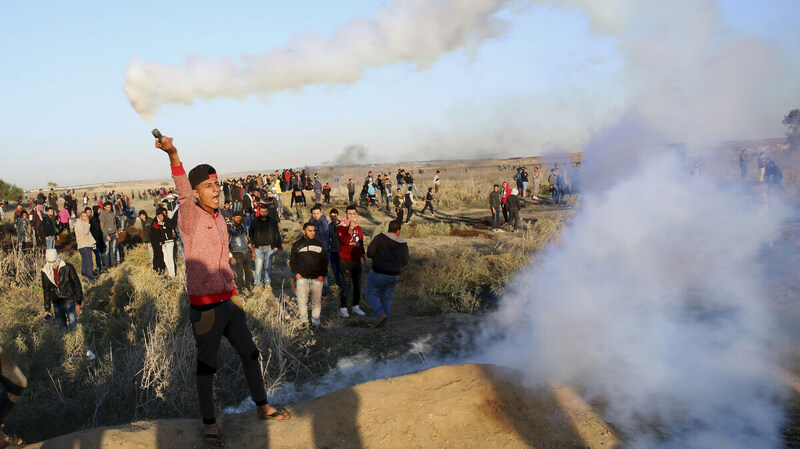 Ghaith al-Omari, a senior fellow at the Washington Institute for Near East Policy and former member of the Palestinian Authority, told Here & Now's Jeremy Hobson this week that Trump's move puts the Palestinians "in a corner." "This announcement has put the Palestinians and the Palestinian president in a politically untenable position," he says. "[Palestinian President Abbas] has been involved with the Trump administration in trying to relaunch the peace process. Right now, politically speaking, it's very hard to see how he can do that." Some experts have suggested Trump should have used the U.S. Embassy location as a bargaining chip to relaunch the peace talks. "This was a giveaway by Donald Trump to the Netanyahu government," Neri Zilber, an analyst with the Washington Institute, told Hobson this week. "For a deal-maker, as Mr. Trump likes to see himself, this was pure victory for the Israeli side without ... the U.S. interests receiving anything in return." This latest move by the Trump administration will likely add to growing unease among the Palestinians that a U.S.-brokered deal with Israel will be unfavorable to them. Last month, the U.S. reversed its decision to close the Palestinian diplomatic mission in Washington, D.C., deciding to impose restrictions that may be lifted after 90 days instead. The State Department had said the Palestine Liberation Organization office must shut down under a provision in U.S. law that forbids it from asking the International Criminal Court to prosecute Israeli officials.